In the new National Geographic documentary Free Solo, Alex Honnold gives a virtuoso performance like none other. The lithe and unassuming 33-year-old climbs Yosemite’s El Capitan– 3,000 vertical feet and 30 pitches in under four hours– without a rope. After watching the heart-pounding film of Alex’s ascent, I am likely one of many who pondered our own close calls with mortality in the wilds. Was it worth it? Would I do it again? Was I prepared? How does putting ourselves to the test in a wild place contribute to personal strength? My own brush-with-death stories include being trapped in the darkness of Thunder River cave in the Grand Canyon. I was 21 in a group of four. All of us were young and immortal before we entered the cave. Then, we watched our last working flashlight tumble into the surging whitewater below us and vanish. One of our group had accidentally knocked it from a friend’s hand as he reached out to steady her. Everything changed in two seconds. Complete and total darkness surrounded us. There could be no panic. A misstep meant falling from the narrow ledge into the river and out over the waterfall. We kept talking and touching, coaxing and reassuring as we edged our way out at last to the light. Afterwards, we lay on our backs surrounded by wildflowers and the surge of Thunder River and gazed up at the sky as if we’d never seen the world before. To be alive! What a feeling. Unlike Alex or John Muir’s close calls, ours resulted from sheer stupidity. We had no business entering that cave with our feeble lights (not even headlamps), no ropes, and armed only with the vague knowledge of caverns and pathways that lay within the cave. Still, I’ll never forget the total focus, the adrenaline, and the lifeline of the touch of another human hand. So yes, it was worth it. Would I do it again? Never. To die out in the wilds sounds infinitely better than tripping and hitting my head getting out of the bathtub. However, the older I get and the more friends and family I’ve lost, the more precious life becomes. Instead of seeking adrenaline-pounding thrills, I value every moment in nature. Many of those experiences are within the sanctuary of our home ground of ponderosas, manzanitas and planted native wildflowers, and of mule deer, squirrels, and songbirds. Mule deer sipping water outside our home windows. 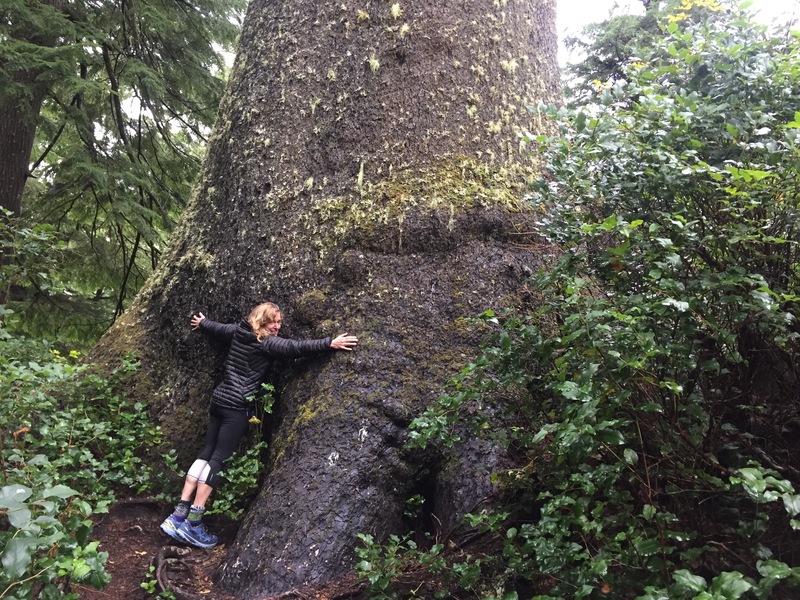 Other joys are admittedly higher on the thrill list, like hiking cliff trails along the Oregon coast where sneaker waves could sweep the unwary into the ocean, or trekking high wilderness peaks of Oregon. While I’m still willing to wade across flooding streams, I use poles and welcome a helping hand. I take calculated risks and continue to grow from the unanticipated challenges, where resourcefulness and self-reliance are essential. The stories from the wilds that we tend to recount the most are those of surmounting adversity–the stove that won’t light, the tricky snowfield crossing, escaping a thunderstorm on a high pass, or losing our way and scrambling through thick brush. For some of us, the risks and adventures contribute to our zeal for saving wild places and wildlife in the spirit of preservationist John Muir. Backpacking in the Eagle Cap Wilderness–crossing snowfields. And that’s where the big question comes in. What’s worth dying for? For Alex Honnold, the freedom and perfection of solo climbing clearly is worth it. He also chooses to live simply and created the Honnold Foundation to support solar initiatives that address living in a sustainable world and lessening poverty. When asked if he’d repeat his solo climb of El Capitan, he said if someone offered a billion dollars for the foundation, he would do it. That’s brave. I’m in awe of all those brave people who risk death to save others and ultimately this planet. I cheer for those who have stood in the path of bulldozers, chained themselves to ancient trees, gone to jail for protesting environmental travesties, or gathered by the thousands in bitter winter temperatures at Standing Rock to halt a destructive pipeline through sacred lands and waters. Like the courageous people of the civil rights movement, environmentalists standing up in peaceful protest make a difference. It takes a mental and moral strength to put lives on the line. For me? I’ve protested and marched. I’ve mourned the losses and volunteered to work to save places and to use my writing to make a difference. I have yet to take those bigger risks on behalf of the wild places. Yet, we may all be coming to that place where we have no choice. If you care for the future, you are an environmentalist. Go to the wilds for sustenance and adventure. Then, give back. Every small step matters and in our collective grand love for this planet, we just might achieve the greatest human achievement of all—saving our home. And live to tell the story. I agree with Wes. Excellent. Wonderfully stated how so many yet so few impact conservation in ways great and small to each of their own strengths and wills. The stewardship God gave us is not as well done by most of us as it should be and we should strive to meet that task as best we can. Dearest Marina, Your blog email lay in my inbox like an unwrapped gift in those busy days leading up to Thanksgiving. Now it is Thanksgiving morning, and in the early-morning quiet, I read your story. I am so moved by and grateful for them and for you. Oh dear friend Marina, you have expressed so beautifully the huge challenge of our time, namely the restoration, preservation, and protection of our precious world, especially the natural world. Thank you for sharing your thoughts and your own personal experience. What a treasure you are and we look forward to another visit soon. “When asked if he’d repeat his solo climb of El Capitan, he said if someone offered a billion dollars for the foundation, he would do it. That’s brave.” How can you call this “brave”? He values his life in a billion dollars and has proved that he would do that for nothing, and then when he came out alive from this “free” feat – he would do it for a million dollars? That’s a meaningless boast, not bravery. Brave is when you protect others in times of war or shield a child from a fire. Thank you for challenging that and making me consider that more, and what the meaning of bravery is. His Foundation is a worthy cause–so maybe the word should be something else–committed? I do like that he’s giving back. http://www.honnoldfoundation.org/#solar As far as brave–Webster definition: “having or showing mental or moral strength to face danger, fear, or difficulty.” Certainly a blog topic to explore! Thanks for your reply. I did not mean to sound so confrontational, sorry, I enjoyed your review. I just think that dictionary definitions are meaningless here – I think it is best to employ common sense. Any foundation is not the point here which was established recently when Alex was already relatively rich. Alex’s “danger, fear and difficultly” are completely self-inflicted – no one can argue with that. What kind of “bravery” is that, then? There were soldiers dying in the WWII so Alex’s generation do not have to face “dangers” and live “in fear”. To hear now of Alex’s feat of “bravery” when he intentionally puts himself in danger and then gets money and fame from it (even unintentionally) is something to think twice-about from a moral perspective. While he also quite clearly and also – unintentionally – promotes this most dangerous and high-risk activity with the possibility of others following and eventually falling to their deaths. Who “wins” with this “arrangement” now is only Alex, let’s face it, hence the need for the Foundation in his mind.